View Poll Results: Who will win the NL Cy Young? Last edited by davidh777; 09-04-17 at 11:25 AM. Re: 2017 MLB Week 23 Sep 4-10 "Labor Day Edition"
Javier Baez's head was OK enough for him to be announced in the starting lineup, but then he was yanked due to thumb soreness from the same collision. Bundy not good today after the gem last week. Anyone know where the Dodgers are? Every single time I'm about to throw in the towel on the Cards season, they spring to life. They've won 4 out of 5 on the road (giving away the one they lost). They're only 5 back of Chicago and 3 back of the Rockies, with the Brewers ahead of them as well. Though the season is winding down, they have a good number of H2H games left with the Cubs/Brewers. It's anybody's guess how this will play out. The bad news--Carpenter/Pham both have injuries from today's contest. But since we've had so much success plugging in AAA players, maybe that will turn out for the best. Clearly not at Dodgers stadium. JD Martinez with 4 HRs! Last edited by Deftones; 09-04-17 at 10:37 PM. Or at Chase Field for that matter. Who was the last to hit four homers in a game? Josh Hamilton? Scooter Gennett earlier this year. The season isn't over yet, and folks have already forgotten about Scooter. Man it really is stunning how the Dodgers went from red hot to ice cold. It kind of feels like the 1995 California Angels all over again. 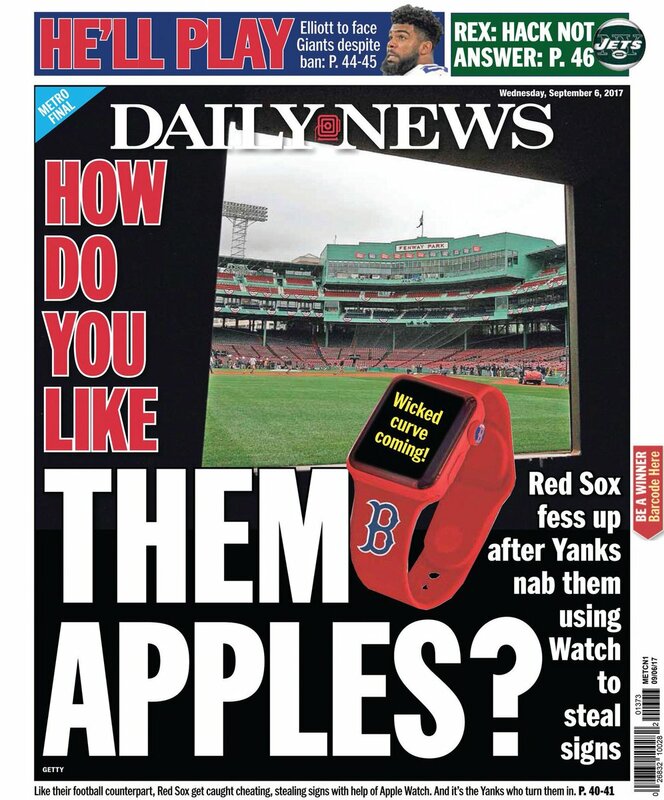 The Red Sox were caught stealing signs against the Yankees. Could be a big punishment. Its a pretty well known rule. Fine Belichick and the Patriots! I'm sure they helped somehow! I was watching a MLB game(can't remember the game) the other day and I could swear I seen someone with a tablet with MLB video on it in a MLB dugout. I thought that was illegal. Goldschmidt had to get an MRI on his elbow. That is never good. Thank god, it showed nothing but inflammation. Everyone here was freaking out. Cubs/Brewers lose. And the Cardinals Memphis Redbirds win again. Things getting a little tighter in the NL. Wow the Dodgers are snakebit lol. Verlander wins his first Astros start. Ariel Miranda started against him, going six innings and 112 pitches, allowing six walks, zero hits, and one run. Arizona won't catch them but it's crazy that the Dodgers are only what 10-11 games better than them now? Take away their ridiculous start, Arizona leads the division. Two great games in the AL East last night. Red Sox played the second longest game ever in Fenway Park(19 innings) and Red Sox won with a Hanley Ramirez walk off hit. Orioles beat Yankees in the bottom of the ninth with a Machado two run dinger.